When the snow begins to fall and blankets of white cover Central Oregon, avenues to new experience emerge. Outdoor enthusiasts witness untouched terrain, families delight in building snowmen and bookworms encounter new worlds near a blazing fire, just to name a few. It’s a pretty magical time in the high desert. So this winter, why not explore these classic Oregon retreats and discover what makes the season so special. 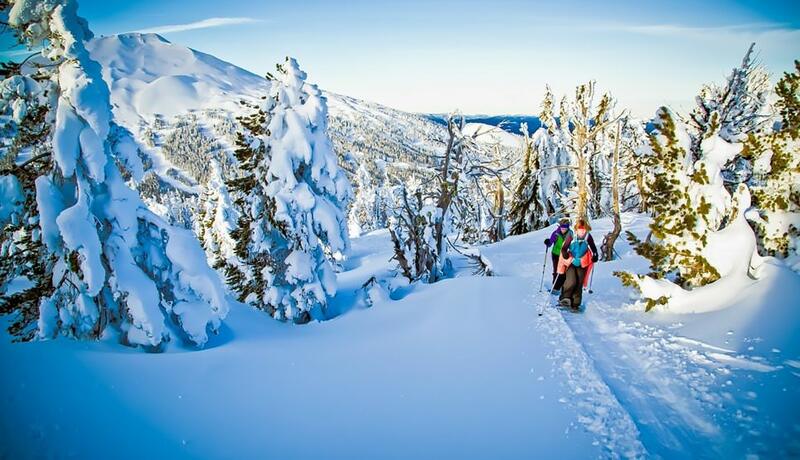 At 6,300 feet in Newberry Crater, the Paulina Lake Lodge attracts new and return visitors to its winter wonderland. Cabins with kitchens and wood stoves allow comfortable and rustic winter escapes. Snowmobilers tour more than 150 miles of groomed trails, while cross-country skiers and snowshoers carve routes that circumnavigate the lake and lead to landmarks such as a hot springs, the sometimes-frozen Paulina Falls and Paulina Peak, with a view that stretches 100 miles on a clear day. “It’s peaceful,” co-owner Karen Brown says. “It’s got beautiful scenic areas to go see and travel to. You can leave from your cabin and go anywhere.” After you explore the prehistoric geology in an area named after a Northern Paiute leader, Chief Paulina, enjoy a meal at the restaurant, which is open Friday to Sunday. 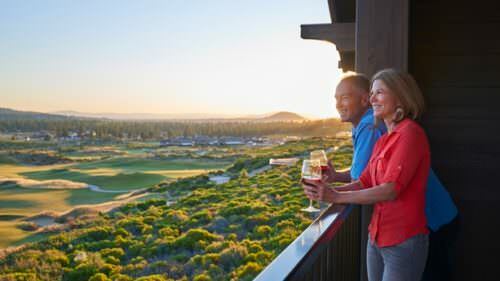 Central Oregon is home to a fleet of destination resorts that offer outdoor and indoor experiences. 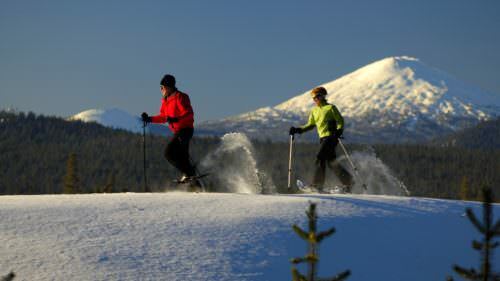 Sunriver Resort organizes a host of holiday activities during its Traditions celebration mid-November through December. Families and children can enjoy holiday fun such as creating winter keepsakes at Santa’s workshop, embarking on sleigh rides, being tucked in by an elf, building gingerbread houses and having brunch with Santa. Adults can also take time for themselves at Sage Springs Spa, while the kids play at Fort Funnigan. 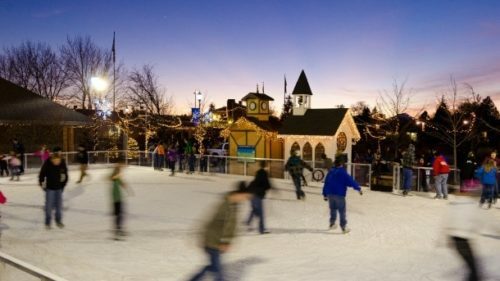 An ice skating rink is close by at The Village at Sunriver, where outdoor equipment can be rented. Or venture 20 miles toward Mt. Bachelor for skiing, sled dog rides, snowshoeing and tubing. Fronting the 253-acre Suttle Lake, The Suttle Lodge is at once contemporary and nostalgic, a haven for urbanites wintering in the Deschutes National Forest. “The cool thing about it is that you feel like you are removed from everything, but it is right off the highway and very easy to get to,” says Lila Martin, spokesperson for the lodge. Guests relax in an unplugged atmosphere with no TVs in the lodge rooms or cabins, which range from rustic to deluxe decor and serve as a base for winter activities. The lodge rents snowshoes for guests to venture around the lake, and you can drive less than 10 miles to nearby Hoodoo Ski Area for downhill, Nordic, snowbiking and night skiing activities. Take an excursion to the Old West town of Sisters, or out to the Metolius River and historic Camp Sherman Store. Return home to rest by the lodge fireplace and listen to vintage vinyl records while enjoying a craft cocktail. Avid explorers can enjoy Oregon State Parks, such as LaPine and Tumalo, in the High Desert. Rent a cabin at La Pine State Park and enjoy the quiet solitude, or try your hand sleeping in a heated yurt at Tumalo State Park. Explore the area on snowshoes or cross-country skis when there is snow, and head up to Mt. Bachelor for more options. While wandering the banks of the Deschutes River, which runs through both parks, gaze into the trees and pause in the crisp stillness of a Central Oregon winter’s day.